Have you read Taxi! yet? Get revved on Helen Potrebenko's unique 1975 novel Taxi! Dear Taxi! 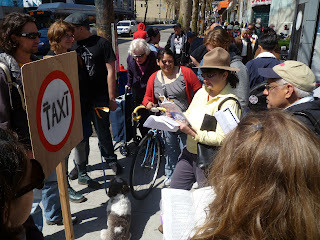 readers and all readers who may not yet have read Taxi! It's 2013. We are still working to bring Taxi! back to the people of Vancouver and beyond. This Taxi! fan just won the Amazon.ca First Novel Award for her novel Malarky and was proud to acknowledge the importance of the continuum of literature and tell the audience about Taxi! and acknowledge the writers: Helen Potrebenko, Renee Rodin and Judith Copithorne for their influence and importance to my work and life as a reader. Helen was vital in helping me complete Malarky and I would like to publicly thank her for her supreme generousity and also consistent gardening advice. We will be planning more Taxi! interventions. Last night at the fundraiser for CWILA I was most excited to meet a scholar Li Wei from China who had written about Taxi! in China and who knew about the importance of this novel. 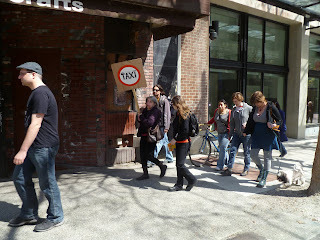 We also sold 4 copies of Taxi! and that means 4 new Taxi! readers. It takes a nation to bring this book back to the kitchen table, please continue to support this quest. Parataxis: the ride THIS SUNDAY! 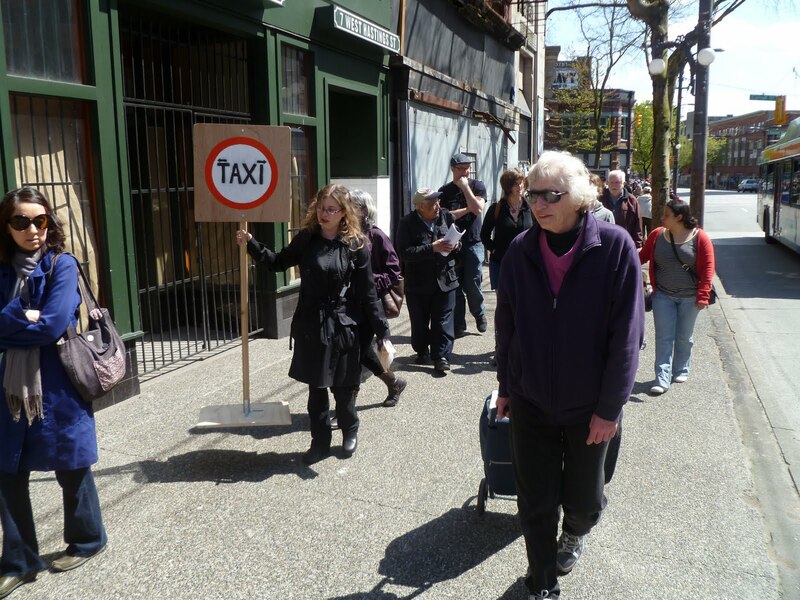 This Sunday at 12 noon departing from Pigeon Park please join us for Parataxis: the ride, a walking/reading tour of Helen Potrebenko's classic Vancouver novel Taxi! This event is part of the Commune de Vancouver and is supported by the Department of Gender Studies at SFU. 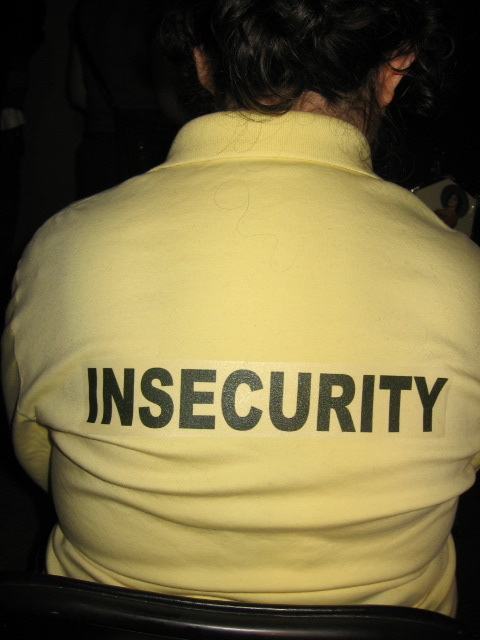 Performance artist Lori Weidenhammer will also be in residence, a return from our first intervention at Not Sent Letters. The weather forecast is for sunshine. Come out and celebrate Workers Day with us. Hey Waitress featured in Vancouver Art Gallery exhibit. A copy of Helen Potrebenko's short story collection Hey Waitress is currently included in the WE: Vancouver exhibit installed at the Vancouver Art Gallery. Exciting Taxi! event happening for Workers Day May 1st. Major news for Taxi! readers. Mark your calendar for Parataxis: The Ride. On May 1st, 2011 we will meet at Pigeon Park at 12 noon and undertake the first walking tour where we interface the text in Taxi! with the places and spaces it refers to. Come on out for this intervention and participate. Bring your copy of Taxi! or buy one from our cart for $10.00. 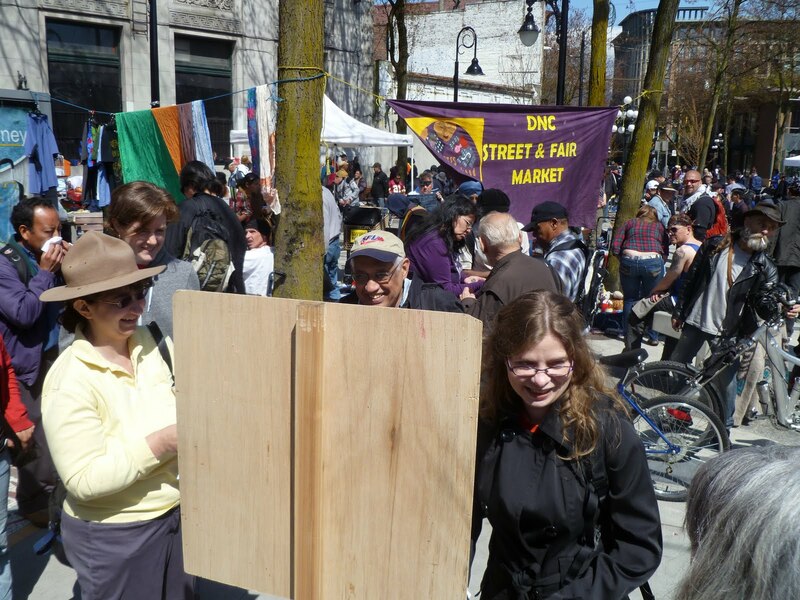 This event is taking place as part of La Commune de Vancouver: Paris Commune celebrations. A new era and direction in the Taxi! revival has dawned. Through a series of transactions and experiments Taxi! will be returned to her readers. The first intervention took place last night to a great response in Vancouver, BC. Thank you so much to Lori Weidenhammer for her generous collaboration and to the readers for engaging with us at the Taxi! rank. All over Canada people are reading Taxi! these days. And these people are feeling Good & Strong. You too can join this joyful bundle. Why don't you organize a Taxi! event? You don't even need a location, have one in your sitting room, all you need is a copy of Taxi! and some good readers or middling ones with spirit. Send us pics of everyone reading and feeling Good & Strong. Take it to the bridge! Taxi! events are affordable and fun. Hail your own. Go to Lazarapress.ca to order Taxi! Remember there are perhaps 600-700 copies left, then that's it. Taxi! has gathered new readers in recent months and we want to hear from you! Share some thoughts on the book and what reading or rereading it meant to you or anything you wish to remark on about the book and we'll try publish it here. Also I did start a group on facebook called have you read Taxi!? We could use a wikipedia page if someone wanted to make one about Helen's work. There also needs to be more events to celebrate the book especially in other parts of Canada. St John's, Halifax, Campbell River, Edmonton, Rio, Kashmir, Ballina, where are you? 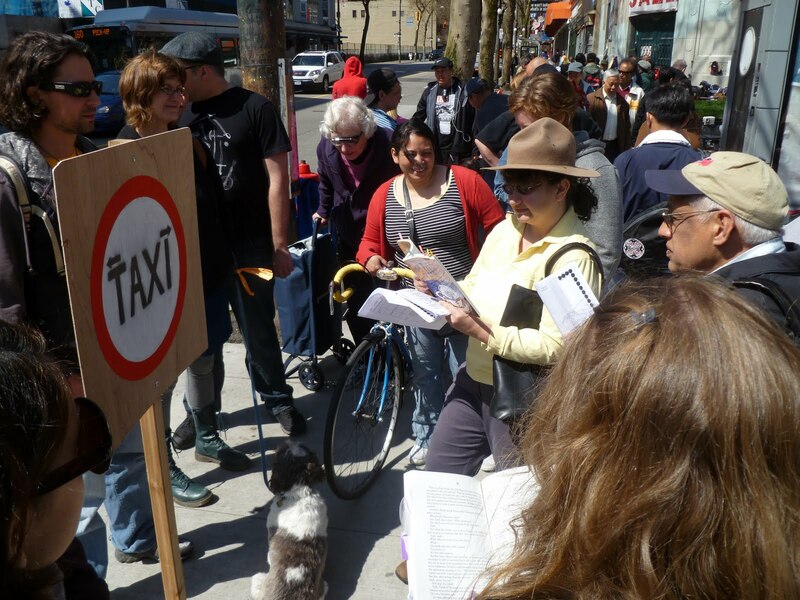 Get a bunch of people together to read Taxi! aloud, add a bit of music and voila you'll all feel Good & Strong. 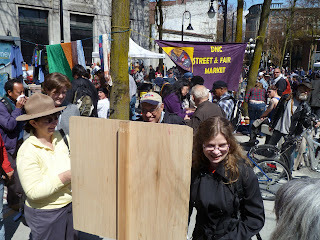 I'll be happy to share the successful format of our recent event at the Vancouver Public Library if you drop me a line. I still wish someone would map the locations mention in Taxi! somehow, either on google maps or some other map interface. Map them as they are described in the book, then take a wander and snap what they've become. One day I promise to go on a wander and try to see what semblance of the city was and is now in Taxi! The Taxi! event at the Vancouver Public Library was an astonishing night. Thank you so much to Taxi! readers old and new for coming out and showing such big love to our event. The attendance was very high, the participation was lovely and the readers: Bryant Ibbitson, Annabel Lyon, Penny Goldsmith, Clint Burnham, Julie Okot Bitek and Marina Roy were astonishing. The event's musical compositions by Cuan Isamu will be uploaded to the blog very shortly. Helen described the night as "wonderful, a very special kind of evening". We all agreed the prose was stronger than ever. Taxi! is a great book, give a copy to a friend, spread the word, organize your own event. I will be happy to supply our original Taxi! music composed by Cuan. If you attended the event please send your descriptions and comments to mrsokana@gmail.com and we can upload them here. Deserves not to be forgotten: Writers hail Helen Potrebenkos Taxi! Events, Novels, Annabel Lyon, MIchael Turner, Helen Potrebenko, Taxi! Alberta-born author Helen Potrebenko published her first novel, Taxi!, in 1975. The book, published shortly after her move to Vancouver from Alberta, told of the struggles of a female cab driver making her way in B.C. 's largest city. 35 years after it hit shelves, Anakana Schofield, another Vancouver writer, is organizing an event to bring some attention to the book, which has fallen off CanLit's radar. "It's part of a "recovery project," says Schofield, "and perhaps a post-Olympian reclaim your city prod. As in - here is your long forgot city literature, take it, possess it, it's yours." The event takes place in Vancouver tomorrow night, and will feature contributions and readings from Annabel Lyon,. Michael Turner, Clint Burnham and several others, as well as a Q&A with the author. "Taxi! was the first work of fiction I read that was set in Vancouver and the first from the perspective of a working class woman", says Michael Turner. "Although I recognized the city I grew up in, I was (through the eyes of Potrebenko's female protagonist) taken to places in an order I was not familiar with, in ways I had not yet imagined. As a man, I could walk through walls to get what I wanted. Potrebenko reminded me that not all narrators are men, and that for a woman to negotiate her way through civic space requires many more fares than her masculine counterpart." "I was struck by the intelligence and the humour and the sass of Taxi!." says Annabel Lyon. "And because my partner drives a cab, so much of it hit close to home. 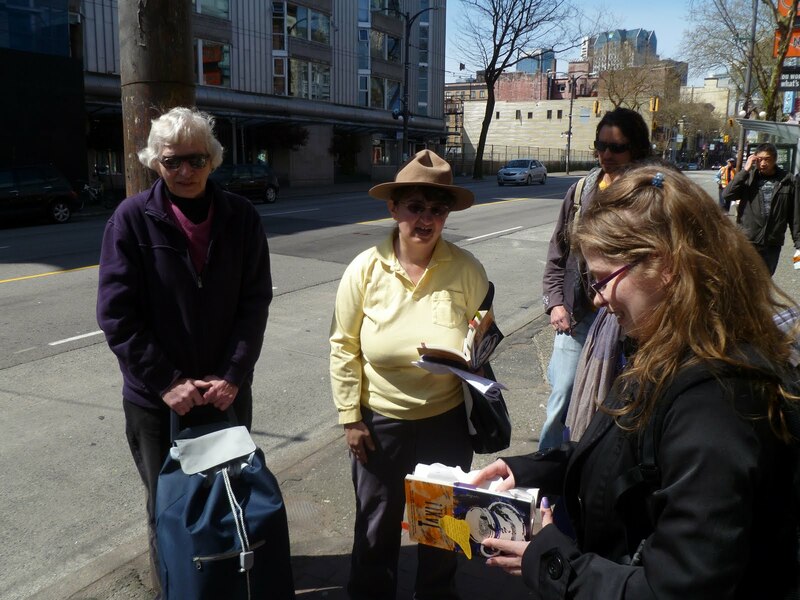 It's a sharp, edgy book, pure Vancouver, and deserves not to be forgotten." Aside from a one night fete for the book, Schofield hopes to get it back into the CanLit canon: "Taxi! is both a vital Vancouver novel and a unique working class literary work that we hope to see taught in universities and schools again and acknowledged for it's contribution to the Canadian literary canon rather than forgotten about." • "Taxi! @ 35" takes place on Thursday April 29, at 7:30 p.m. at Vancouver's The Central Library (350 West Georgia Street). Admission is free. For more information visit Anakana Schofield's blog. Thursday April 29, 7:30 p.m.
Vancouverites hail Helen Potrebenko’s classic Taxi! 35 years after Taxi! first revved up Vancouver literature, join us to celebrate this fine novel. Taxi! is a novel about a woman and a worker in a city. Our city, your city, your literature. Annabel Lyon, Clint Burnham, Julianne Okot Bitek, Penny Goldsmith, Marina Roy, Michael Turner, Anakana Schofield and Cúán Isamu. Taxi! author Helen Potrebenko has been included in SubTerrain's double issue on Vancouver's Literary Landscape. SubTerrain is available on newstands. Helen was also featured recently on SFU radio. Taxi! readers rejoice at this much deserved focus on Helen Potrebenko's work. 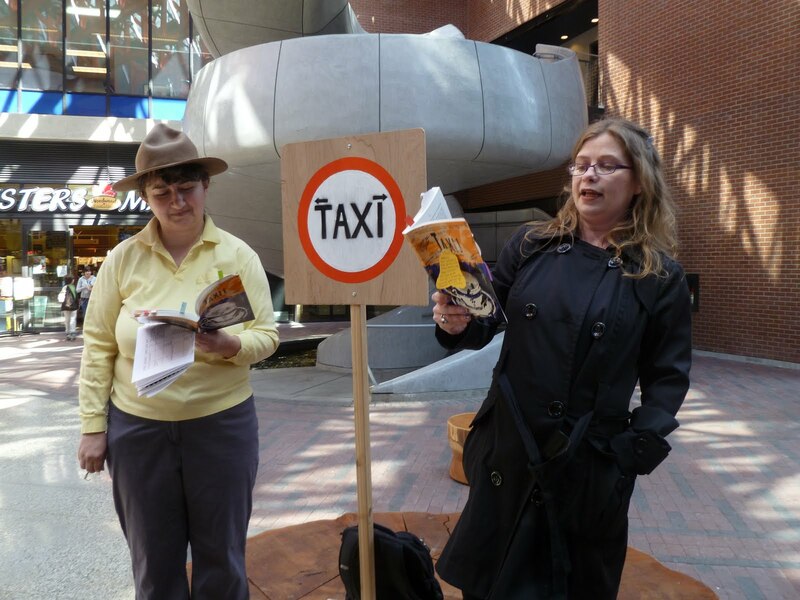 Local writers will read extracts from the novel Taxi! and there will be a Q&A with author Helen Potrebenko. Mark your calendars, please come and join us and share your experience of reading Taxi! or come and become revved up on a classic Vancouver novel. 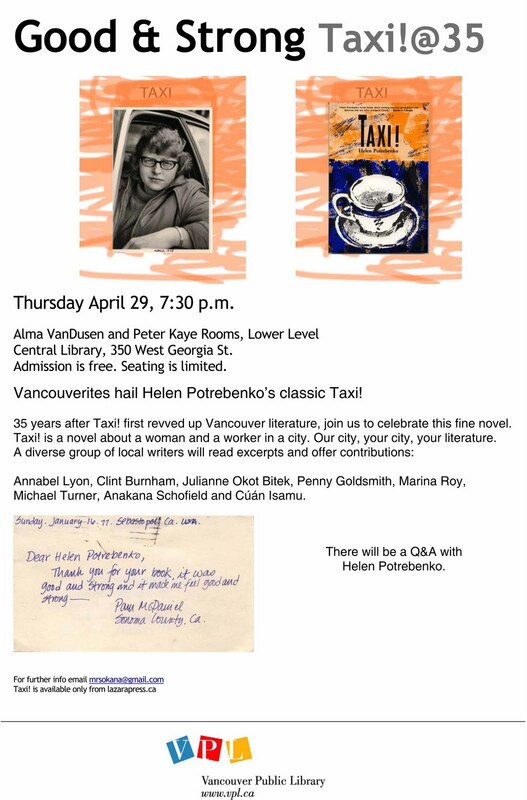 There will be an event at VPL in 2010 to celebrate the 35th anniversary of Taxi! More details to follow. Watch this space for details. Due to unprecented interest from French Taxi readers, a translation of Taxi! Buried Treasure article has now been uploaded here. Corrections and improvements welcome! Would Shannon become Simone or Sylvie? Joe le taxi to follow. A recently submitted list of music being listened to in the taxi of Taxi! revivalism. Article in Saturday July 24 2009 Globe Books section on Taxi! Taxi!, an autobiographical novel by Helen Potrebenko (left, in a 1974 photo), was published 35 years ago. Its narrator says, "it just never occurs to [customers that] we're people and not zoo animals to be stared at:' Anakana Schofield, who contributes to these pages, is organizing a celebration of the book - "a kind of reclaimyour-city literature/recovery project," she says, adding: "I'm especially interested in working-class narratives" - so that a new generation of readers can discover it. It's taking place Thursday, 7;30 p.m., at the downtown public library.